Hedge Fund Brother No. 1 Xu Xiang, pictured above, was once a high flying hedge fund manager who never lost. Then one day he was disappeared. He resurfaced months later, after being convicted of securities fraud and now sits in jail. 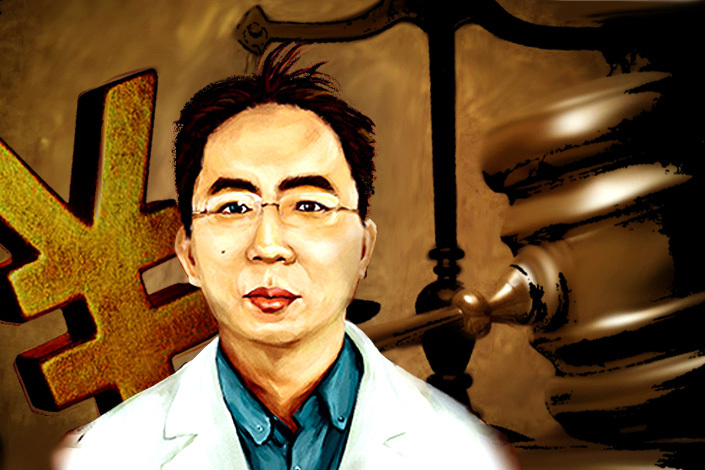 Some feared Bitcoin exchange heads could face a similar fate; however, the PBOC showed mercy. Offering leverage and margin trades. Producing fake volume and manipulating the market using zero fees. Violating regulations on foreign currency management and cross-border capital transfer with bitcoin. Replacing fiat by using bitcoin to purchase goods. Engaging in false advertising or participating in Ponzi schemes. Providing financial services without a permit, including credit, securities, and futures trading. After the “friendly” meeting, exchange after exchange announced an indefinite suspension of Bitcoin withdrawals. No further guidance was given as to when Bitcoin withdrawals would resume. The price sagged a bit, then shrugged off the news. By the end of last week, Bitcoin would hit fresh all time highs in USD terms. The new strategy is to starve the weak, and regulate the strong. This strategy is classic China. The government lets an industry compete unimpeded for a time, then they pick the strongest companies and destroy the rest through denial of critical licenses or enforcement of opaque regulations. By removing the elixir of leveraged and zero fee trading, only exchanges with diversified business lines will survive. Earnings from spot Bitcoin trading will only be significant for the largest of exchanges (BTCC, Huobi, and OKCoin). Exchanges not on that list, will most likely not exist in 2018. All three of those exchanges either have mining operations, payment solutions, and or offshore derivatives trading markets. Once the weaklings fold, the PBOC will bless the large incumbents and subject them to rigorous monitoring. Viewed on a longer time frame, the developments over the past three months are positive. One of the Damocles swords hovering over Bitcoin slowly is being removed. Bitcoin will not be “banned” by the regulators. They recognise the power of the underlying technology and are attempting to rationalise Bitcoin within existing goals for China’s monetary system. PBOC Governor Zhou in a recent interview stated that China Bitcoin trading platforms are not exchanges but rather only “websites”. That is encouraging that the PBOC permits mere “websites” to accept deposits like banks, and offer the trading of currency like an exchange. There is a bright future for Bitcoin in China for those who can survive. The PBOC tacitly approves Chinese people trading Bitcoin. The current purgatory will end once the PBOC right sizes the Yuan. Calm must be maintained up until the October National Congress. After October, Beijing will greenlight the PBOC to relieve the pressure and devalue. After a large devaluation, the PBOC can loosen capital controls because once the damage is done the desire to flee is lessened. At that time Bitcoin withdrawals will be re-enabled.